Soup season is upon us! Nothing beats a fall weekend full of sweaters, football, and homemade soup. 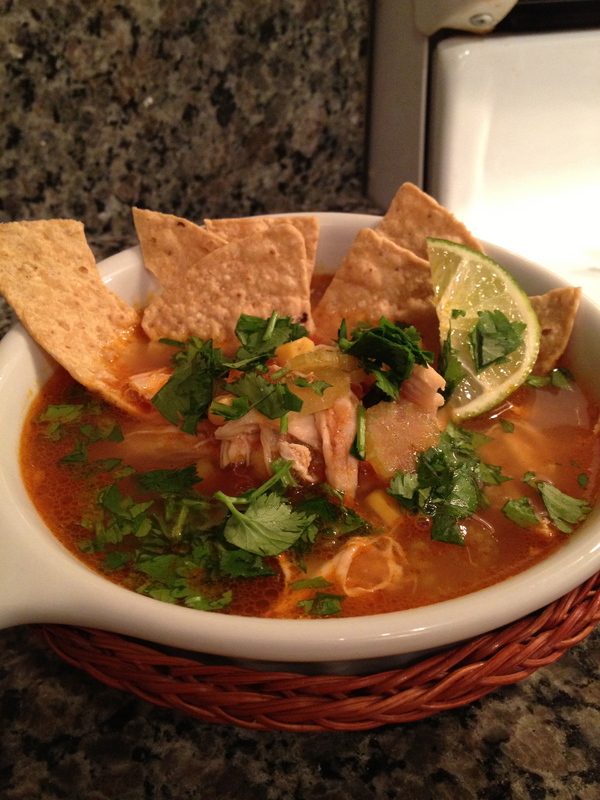 This recipe was adapted from http://www.myrecipes.com/recipe/chipotle-chicken-tortilla-soup-10000001087094/. First, make your own chicken broth (thanks, Mom)! Pour the water into your pot and place the two chicken breasts in. Add your chopped celery, chopped onion, and minced garlic. Add a dash of salt and pepper. Bring to a boil, reduce to a simmer, and put the lid on. Let it simmer for 45 mins. Remove the lid. Carefully transport the chicken breasts to a cutting board to cool. They’ll be tender! Add the tomatoes (unstrained), corn, adobo sauce, and spices to the broth. I don’t put the chipotle peppers in the soup, just the adobo sauce. If you’re looking for a stronger kick, mince a pepper and toss it in. Add water if it appears too dense. Remove the skin and bone from the chicken breasts. Using two forks, shred the chicken by pulling it apart. Discard fat. Place the shredded chicken in the broth. Stir. Put the lid back on and let it sit for about 20 minutes. Serve with tortilla chips and a wedge of lime. Delicious! Happy weekend! This entry was posted in Cooking In and tagged eating in, Mom, Soup, spicy, vegetables. Bookmark the permalink. The picture makes me want to eat the soup right off the screen! I love the fresh cilantro. Looks like one does not need to be a soy-free eater to enjoy this recipe. Thanks for sharing. Thank you! I forgot to add the sprinkle of fresh cilantro in the recipe!